We don’t like clothes having stains on it. So our customers would not like it too. 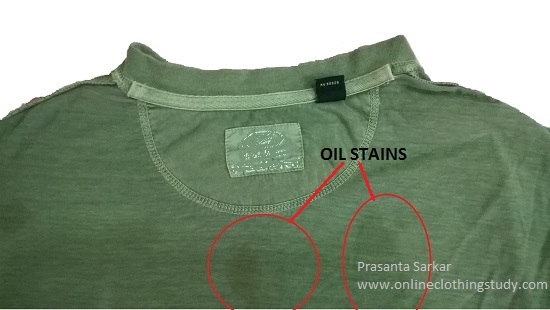 In garment manufacturing where garments are stitched oil stains may be often found in garments. Stains are considered one kind of defects in garments, which leaves an unpleasant mark on clothes. In case such stains found on garments, factories remove stain by spotting or washing prior to packing garments. There is a cost involved in removing the oil stain. It is better to take precaution in material handling throughout the manufacturing process - from fabric receiving to shipping the packed garments to avoid oil staining. How to avoid such oil stains? Following are few best practices that should be followed by garment factories to reduce oil stains in garments. 1. Clean sewing machines 2-3 times daily. Keep the machine and machine table neat and clean by cleaning machine 2-3 times a day. This activity will help you keeping your garments free from dust and other kind of defects generations. 2. When operators leaving factory in the evening tell them to place a piece of cloth under the pressure foot. In conventional sewing machines oil and lubricants used which dip through needle bar and spread over feed dog, throat plate and places near the needle. Working on such table a piece of cloth would absorb the oil. By placing the cloth piece you can avoid oil staining in clothes. 3. Keep your floor and workstation neat and clean. Also clean the shop floor, workstation and equipment like trolleys and basket used for material handling. 4. Use dry head sewing machines. Now-a-days dry head and semi-dry head sewing machines are available. In conventional sewing machines, oil is used to lubricate machine frame and moving parts. The machine oil come in contact to the material sewn and causes oil stains in garments. You can replace normal machines by dry-head machine to avoid the chance of oil staining. 5. Improve material handling and don't keep/throw garments on floor. Garment come in contact with dust, oil and grease when garment lies on the floor and in the walking space. Always keep garments and bundles on the assigned center table or in the basket. While transporting garment from one section to other section – like from cutting to stitching department or from stitching to finishing department, use bag or clean trolleys. 6. Don't open machine head on the floor/stitching line where work is going on for repair/maintenance purpose. Allocate a separate place for machine maintenance. While you are doing maintenance or machine repair, you may need to open the machine head. There is chance of oil spilling on the machine table. So be careful while opening the machine head and aside bundles from the tables. Once repair work is done, clean machine and table. List of things you should do in your factory to avoid oil satin in garments.